Be nice. As people, and women especially, we already spend too much time tearing each other down and competing with one another. This is not the place for harsh criticisms or negativity. We are in this together. We’re on the same team! And while I welcome ideas from readers of all walks of life, I simply ask that those ideas be expressed with respect for one another and a little (or, if the situation warrants, BIG) drop of grace. companies specifically authorized to perform monitoring, technical, analytical or diagnostics services or tasks on our servers and or other equipment. When you use our services our view content provided by us, we automatically collect information about your computer hardware and software. This information can include your IP address, browser type, domain names, internet service provider (ISP), the files viewed on our site (e.g., HTML pages, graphics, etc. ), operating system, clickstream data, access times and referring website addresses. This information is used by Nezinscot Farm for the operation of the Subscription Service, to maintain quality of the Subscription Service, and to provide general statistics regarding use of the Nezinscot Farm Website. For these purposes, we do link this automatically-collected data to Personal Information such as name, email address, address, and phone number. The Websites are not intended for or targeted at children under 16, and we do not knowingly or intentionally collect information about children under 16 If you believe that we have collected information about a child under 16, please contact us at privacy@Nezinscot Farm.com, so that we may delete the information. Personal information collected includes an email address, optional demographical information, IP address and date/time stamp. This information is retained indefinitely in a secured database environment as an account for the newsletter subscription. The personal information is used for distribution of the email newsletter, account administration and customer service purposes only. This information is collected directly from the subscriber. Private information such as telephone numbers, fax numbers, email addresses and postal addresses will not be used for the purpose of marketing third party products, services or organizations – and are strictly retained for purposes relating directly to Nezinscot Farm and its related services. Individually identifying information collected includes the IP and host address information of our users. This information is a collection without notification to the user. The information is used purely for general web traffic statistics and reports. The information is not used to monitor, track or report on the usage of individual users unless the user is suspected of illegal or unauthorized usage of any component the Nezinscot Farm infrastructure is comprised of. Additional information collected on users which is considered non-personal, and is collected without prior knowledge of the user includes: browser version, time and date stamp of all transactions against the Nezinscot Farm server, referral information, country of origin, city of origin, hosting provider. otherwise to fulfill the obligations under the Nezinscot Farm Customer Terms of Service. We use Navigational Information to operate and improve the Websites and the Subscription Service. We may also use Navigational Information alone or in combination with Personal Information to provide you with personalized information about Nezinscot Farm. If you have elected to receive marketing communications from us, we retain information about your marketing preferences for a reasonable period of time from the date you last expressed interest in our content, products, or services, such as when you last opened an email from us or ceased using your Nezinscot Farm account. We retain information derived from cookies and other tracking technologies for a reasonable period of time from the date such information was created. Our customers can use the tools we provide, as well as tools provided by third parties, to collect Navigational Information when you visit their webpages on the Subscription Service. Nezinscot Farm does not control our customers’ use of these tools, nor do we control the information they collect or how they use it. Nezinscot Farm is ©Copyright 2018 Nezinscot Farm. All rights reserved. 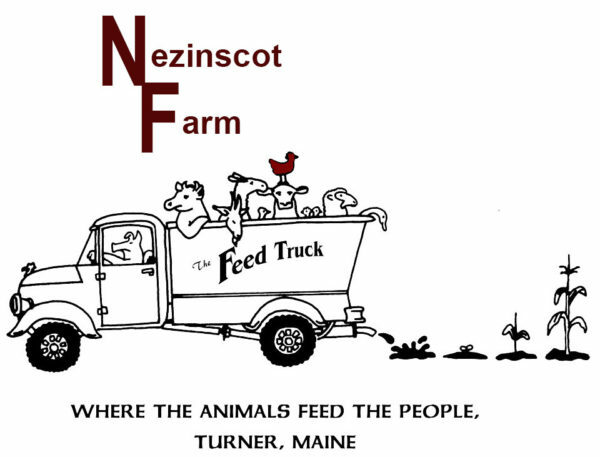 Nezinscot Farm ™ is a registered trademark of Nezinscot Farm. Trademarks of third parties are used with the permission of the trademark holder. Unauthorized duplication in part or whole is strictly prohibited by international copyright laws without the prior written consent of Nezinscot Farm. By using Nezinscot Farm you acknowledge your acceptance to the terms and conditions set forth in this legal document and are bound to its terms. Nezinscot Farm reserves the right to prohibit users whose intentions may be considered malicious or against the best interests of the Nezinscot Farm. Nezinscot Farm content may be used exclusively for personal non-commercial and educational purposes providing i) no direct or indirect monetary gain will arise from its use; ii) photographs and illustrations may not be used under any circumstances; iii) and maps are unaltered; iv) text may be used with appropriate educational references v) the content is not plagiarized under any circumstances; vi) if incorporated as part of a document or presentation, credit and copyright is to be conspicuously displayed in a location relative to the Nezinscot Farm content used stating “Courtesy Nezinscot Farm Inc. All rights reserved. (C) Copyright 2018”; vii) prior written consent from Nezinscot Farm is required if the content will be part of a publication with a circulation greater than 50 (fifty) copies and or recipients whether electronically, in print or otherwise. All advertised features and specifications of the Nezinscot Farm services are subject to change without prior notice. Nezinscot Farm is provided on an “as-is” basis. Nezinscot Farm makes no guarantee or warranty as to the accuracy, suitability, performance, compatibility, applicability, reliability or availability of the Nezinscot Farm web site or its content. In no event shall Nezinscot Farm be held responsible for any direct, indirect or consequential damages either financially, physically or otherwise, due to the use of Nezinscot Farm even if due to the negligence of Nezinscot Farm. This agreement (the version held at web address http://www.Nezinscot Farm .com/legal-privacy-disclosures) constitutes the full and complete understanding of the terms and conditions of using the Nezinscot Farm services at all times, and supersedes any prior versions or contracts pertaining to membership or usage of Nezinscot Farm services. This agreement may be modified from time to time without prior notice. Any and all future modifications to this agreement will be posted to this page. Changes to this agreement which Nezinscot Farm considers “major” or “of importance” will be highlighted for a reasonable period of time. This document was last updated April 30 2018.